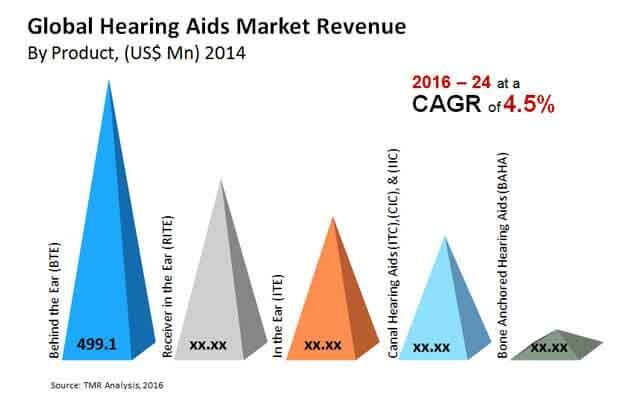 The global hearing aids market displays a largely oligopolistic competitive landscape with just six players holding a major market share. The dominance of these six market players is manifested in the fact that they held 98% of the total market share in 2015. Hence, the entry of new players is extremely difficult, and if a market player finds its way into the market, it is at a high risk of toppling down. Moreover, the initial investment required for a new market player to enroot itself in the market is extremely high. This further discourages new players from entering the market and recalibrates the focus on the established players. Siemens Healthcare, Widex A/S, Starkey, Sonova Holding AG, GN ReSound, and the William Demant Holding Group are the top players in the global market for hearing aids. These players are prognosticated to engage in core research to develop better offerings for the customers. Transparency Market Research (TMR) estimates the key performance indicators of the global market for hearing aids over the period from 2016 to 2024. The market was valued at US$4.7 bn in 2015 and is forecasted to rise to a value of US$7 bn by the end of 2024. The CAGR of the market over the period from 2016 to 2024 is expected to settle at 4.5%. The adult hearing aids segment outdid the pediatric hearing aids segments by capturing a market share of around 95% in 2015. Several governments are making efforts towards enhancing the quality of life of the populace. Since hearing impairments can be a bane for the people, governments have increased their spending towards equipping patients with hearing aids. This has created growth spaces within the market by offering lucrative opportunities to market players. Moreover, the geriatric population is at a higher risk of suffering from hearing losses, thus, making them the primary consumer of the market. The rising geriatric population, especially in North America, is expected to play an instrumental role in propelling demand within the global market for hearing aids. People suffering from hearing impairments have been anticipating new technologies and better products that can ease their discomforts. Hence, the new products that surface in the market are expected to be readily accepted by the consumers. Hearing impairments can also be caused due to untimely treatment of shocks and injuries, thus, necessitating the need for hearing aids within industrial units. The emerging economies are still far from attaining prominence within the healthcare industry. Hence, it is difficult to provide hearing aids at subsidized rates to the all the patients, which hampers the growth of the market. Furthermore, hearing aids require regular replacement of batteries or repair of the machinery, which is not feasible for low-income groups. Hence, the penurious economic situation of the underdeveloped and developing countries is posing a threat to the growth of the global market for hearing aids. Nevertheless, the efforts of the market players to offer durable products at reasonable prices would serve as a boon for the market in emerging economies. The review is based on a market research report by TMR titled, “Hearing Aids Market (Product Type - Hearing Aids (Behind the Ear (BTE), Receiver in the Ear (RITE), In the Ear (ITE), Canal Hearing Aids (ITC), (CIC), & (IIC)), Bone Anchored Hearing Aids (BAHA); End-user (Pediatric, Adult)) - Global Industry Analysis, Size, Share, Growth, Trends, and Forecast 2016 – 2024”.